As things build up on the Tenth Floor and we are ironing out our new events section, things have been quite hectic behind the scenes, and behind the camera. 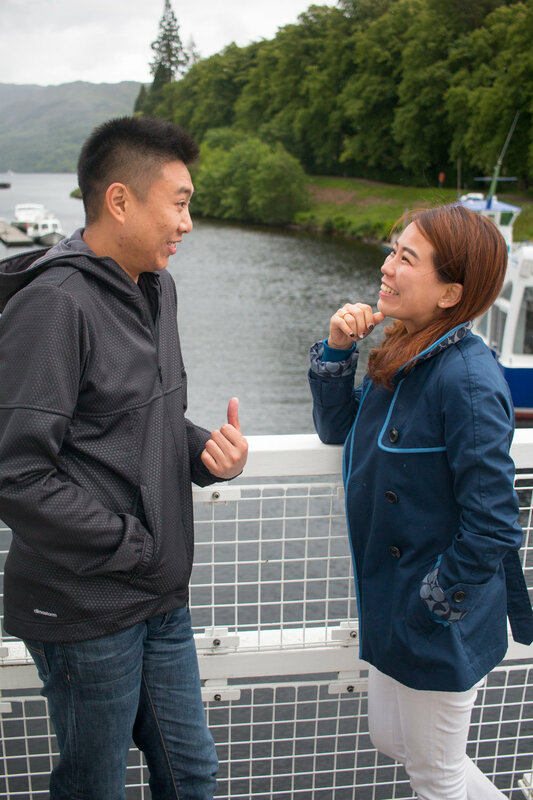 Last Friday (15th June) I was hired to join a tourist tour of the Highlands. The brief was simply to take photos of them out and about in different locations. I really didn't have a lot of info to go with, and so this seemed terrifying. Especially on my own with no support from the team, as they only wanted one photographer. Having recently photographed the High Hopes Hike for Bloodwise, I was concerned that there may be some trekking or rough terrain involved. Trust me, photography is like driving. People find it tough to understand how it can possibly be tiring. Combining that with trekking is unreal. On top of this being a 15 hour job. Yep. 15 hours. So we set off. No English was spoken. It was so surreal, just sitting in the front of a Mercedes nine seater not understanding anything. To say I was anxious is an understatment, but I focused on the scenery and kept myself occupied by playing around with my camera and jotting ideas unrelated to the job in my notebook. At the next stop I quickly realised that they were very couple orientated, and mostly wanted photos like that. We continued down the side of Loch Ness. I was told to look out for nice spots, but really they spoke for themselves. The weather certainly wasn't on our side, but we perservered. I was shooting 7 shots/second, and had a battery pack with two fully charged batteries with another in my bag, but I was still conscious of the amount of photos I was taking. But still, I was only getting started. I tried to keep the camera going. See, I'm the kind of photographer that needs to warm up, and my state of mind shows a lot in the images I capture. If I'm angry, it will show, if I'm feeling happy, the images improve. If I'm nervous, they are the worst. Now I was getting comfortable. I don't specialise in portraiture, but do still have quite a lot of experience over the years. One thing that is vital is that your subjects are comfortable in your presence. Consider this setting: these people are in a new place, they don't speak much English, I don't speak their language, they have never met me, and I'm ordering them about. Surprisingly, they were so natural. I was making jokes they didn't understand, but they could see I was laughing, and through human nature began laughing too. It was a great feeling. I really liked the order of the tour. It gave me that much needed chance to warm up and I knew the best, Glencoe, was yet to come. At times I even got a chance to nap in the car. Towards this leg of the journey, I noticed something. The smell of alcohol. It turns out they had been drinking for some time! I had heard cans open, but thought nothing of it, then they crack the whisky! Once they knew I knew, cans were flying in my direction, and I was on it too! Now we were all really relaxed. I remember thinking early on, 'God they go to the toilet a lot!' I got sipping on some Dalwhinnie, and there's nothing like a glass of whisky in the Highlands!! Right, off the drink and back to the photos. Glencoe time. And then it was done. Tired was an understatement. They were shattered too. We arrived in Glasgow late evening. Ok, it was hardly the 10 mile hike we did for Bloodwise, but the hours were longer and the pressure was on due to the pay for the job and the solo effort. All in all though, you get quite a rush from events like this, and in a way it's emotional. I know exhaustion makes you feel that way, but it's having the privilage of capturing that special day for someone, it's getting to know new people, even if they don't speak your language very well, it's the feeling of utter relaxation as you realise you've done a good job. The photos are very much 'me', and I am delighted that my style is finally achieved and cemented. Not only am I honoured to have been asked to capture such an incredible day, I am also proud of myself for getting through it, considering I was terrified and really didn't know what to expect. I know I'll never see these people again, but I won't forget my first expert challenge, and won't forget the experience. There were 200 photos sent to them in total, although only 70 were agreed. I just couldn't choose. Proof that I was having a great time. I wish my Malaysian friends all the best for the future, and thank them for the opportunity.